Achieving excellent oral health does not only stop in having straight, white, and healthy teeth. People should keep in mind that the other oral structures should be kept in shape as well – for instance, the gums. These tissues are vital since they help keep the teeth intact in their sockets. With that said, compromising the gums would also put the teeth at risk. Aside from performing proper oral care practices for the sake of the teeth, make sure that the gums can benefit from it as well. Here are some easy and useful tips to follow! Cigarette or tobacco use is detrimental to both the general and oral state of a person. There are already many reasons for smokers to quit but here is one more: it can lead to gum disease. Smoking weakens the immune system of a person; as a result, it would be harder to fight the development of an infection. In addition, it may slow down ones healing ability in case that the gums are damaged. Brushing gets rid of food particles, plaque, and bacteria that accumulates between the teeth as well as the gums. If these particles are left unremoved, they increase a person’s risk of developing cavities and gum inflammation. It is best to use a soft-bristled toothbrush to remove deposits effectively without causing the oral structures harm. Investing in an electric toothbrush is a good investment. Flossing should be performed since it takes care of the 35% that the toothbrush tends to miss. Patients should keep in mind to never use the same piece of floss repeatedly since it will cause the bacteria to spread. As much as possible, limit the consumption of sweet beverages or treats since these increase the risk of a person in developing oral complications. If it lingers too long in the mouth, it attracts bacteria which can cause gum disease and other problems. Aside from oral hygiene practices at home, it is best to seek the assistance of a dentist regularly. 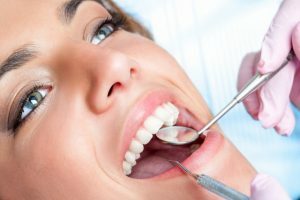 With routine checkups and cleanings, patients can rest easy since these can ensure the health of their teeth, gums, and other oral structures. If you notice or experience any irregularities with your gums, make sure to address the issue with us at Shawn A. Walls, DDS. We will properly determine the cause of the problem and provide treatments accordingly. If it is gum disease, we cater to the needs of our patients with our Periodontal Treatment. For more inquiries about Periodontal Treatment in Johns Creek, GA, call us at Shawn A. Walls, DDS! You can also visit us at 10700 Medlock Bridge Rd., #202, Johns Creek, GA 30097.